A different blog this time. Less about food. Something about travel. I was in Prague for work last week. When I say I was “in Prague”, I mean I saw the outdoors from indoors within various restaurants, my hotel bedroom, conference rooms, a hotel lobby and random company coach rides that transported our 500+ army of selected European employees. We RULED the indoors of multiple Czech establishments. We were the business cockroaches of the city. And the window was our friend. I hate staying in a country and barely seeing it. You can never really say you were actually there. Even though you were there. But you weren’t. But you were. But you weren’t… Yes, this can go on for a while. I did manage to get some time to myself though and venture out of our massive, towering hotel for an hour. I’m pretty sure I was approached by a spy as I was sitting on a bench by the river and actively throwing loaves of bread at ducks. *Deliberate misspelling of Israel to sound like a Russian accent. It’s hard to type accents. He walks away. I sigh a relief. I then ponder, “Was that tall, raincoat clad, briefcase wielding dude a spy? Hang on… Wait… Am I A SPY”??? I wonder if I am an agent of the shield and perhaps I blinked the wrong way which portrayed my amateur status and I have to be reprogrammed or destroyed. 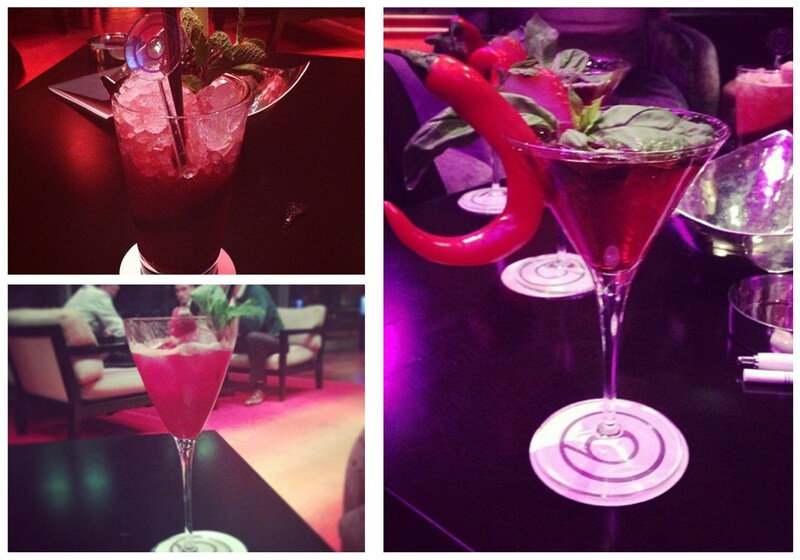 I then realise I’ve allowed my thoughts to wonder into the random again… Back to the Hilton Prague. Ugh. A “Hilton”. I wonder how many more dresses, cars, houses and private jets our company just contributed to the Paris Hilton brand. I shudder to think. Despite barely seeing Prague, what I did see through the windows from indoors, I enjoyed and it was fun work-wise. I travel a good bit for work but this was intense. The 4 days were a marathon of rushing from meetings to more meetings to quick hotel room changes to bars to coaches to restaurants to more bars to more meetings and so on. I barely remember sleeping. Did I sleep? I remember a room, a bed, a floor… but did I sleep? Ah sleep is for the weak! 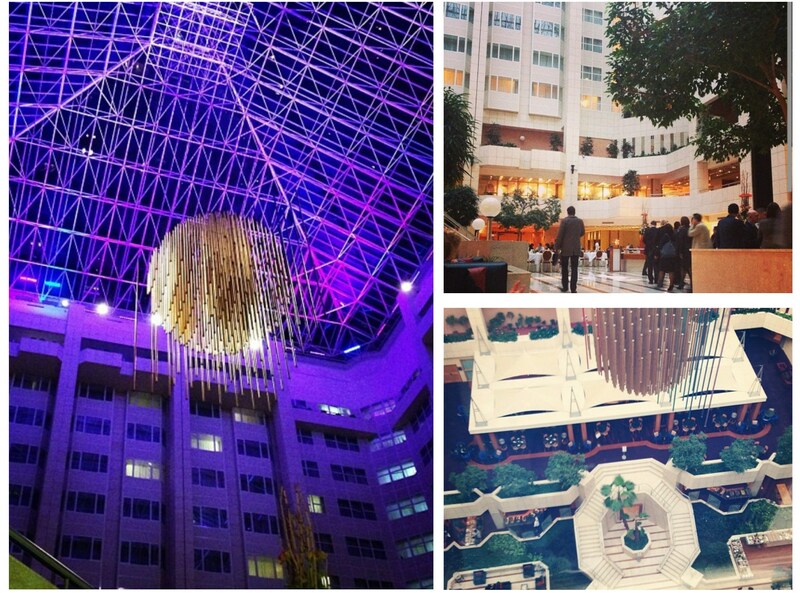 Despite being part of the drab* Hilton brand, the hotel was nice. *(Views and opinions of hotel brands, Heinz versus Hellman’s, twerking, Madonna’s British accent, why Canadian’s say ‘aboot’ etc, are of my own and do not reflect the opinion of my company, my butcher, the barista who served me my soy milk cappuccino in Starbucks this morning, my hairdresser or the ducks I threw bread loaves at). At the top of our hotel was the sky bar, otherwise known as the “Cloud 9 Bar”. It was a fun maze to get to between catching an elevator to a random floor, following the hidden, ambient advertising signs that lead to a service corridor suspiciously resembling the one from a scene in “American Psycho”, then catching an additional lift that brings you to another floor. The elevator doors suddenly part and present a long corridor whose decor resembles the love child of Studio 54 and Hugh Hefner’s bedroom. It made me want to crimp my hair and don a bikini. But it did give us a great view over Prague. More indoor to outdoor viewing. More windows. 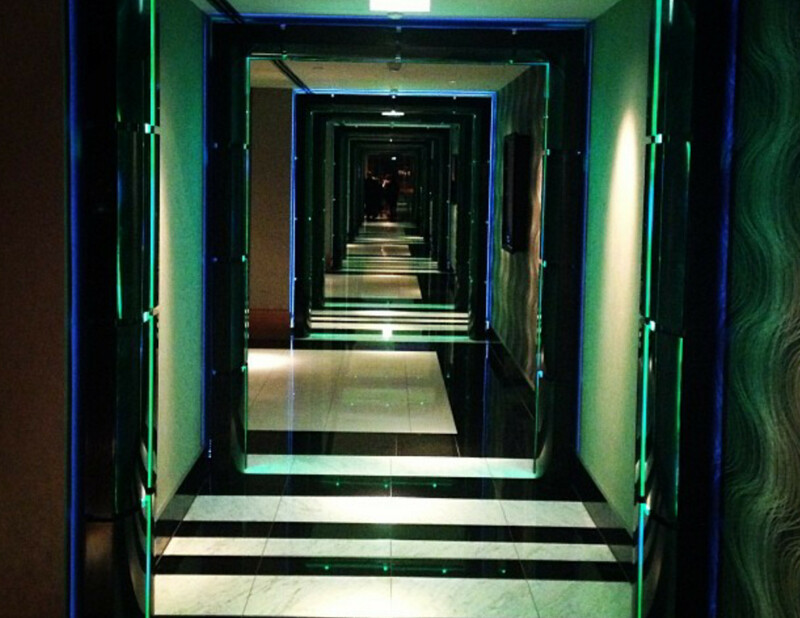 At the end of this corridor, we reached the Cloud 9 Bar… “(or the Bar of Opposite Personalities)”. This was the place where the flamboyant cocktails loosened the work ties and suddenly our very formal, corporate and powerful business colleagues were transformed into loud, vivacious, shot drinking hillbillies where business talk was supported by various slurs and “WE ROCK” high fives. Thankfully, no one decided to strap their tie to their head, á la Rambo style. But it was close. On our final night we had the Gala Ball in a conference centre somewhere in Prague. I took in whatever view I could from our coach ride to the venue. This exercise was futile. This time, the window was not my friend. The centre was excessive and hired out for our company which basically gave us more room to carry out the usual nonsense, frivolity and networking. Except this time, woman wore cocktail dresses and the men wore… well exactly the same; suits. The food was formal (trout, veal and a selection of desserts), the waiters were EXCEPTIONALLY friendly and the wine tasted like a hangover in a glass. On the large main stage, the Czech performances (which were designed to inject us with some local culture) went largely unnoticed… The necessary “What do you do for our company in your country?”, type questions and sizing-up chatter was abundant… But with alcohol, it’s called “Business banter, darling”! Meal over, Czech performances generally unappreciated, a few of us ventured upstairs where we plonked into massive bean bags that overlooked the river and bridge. 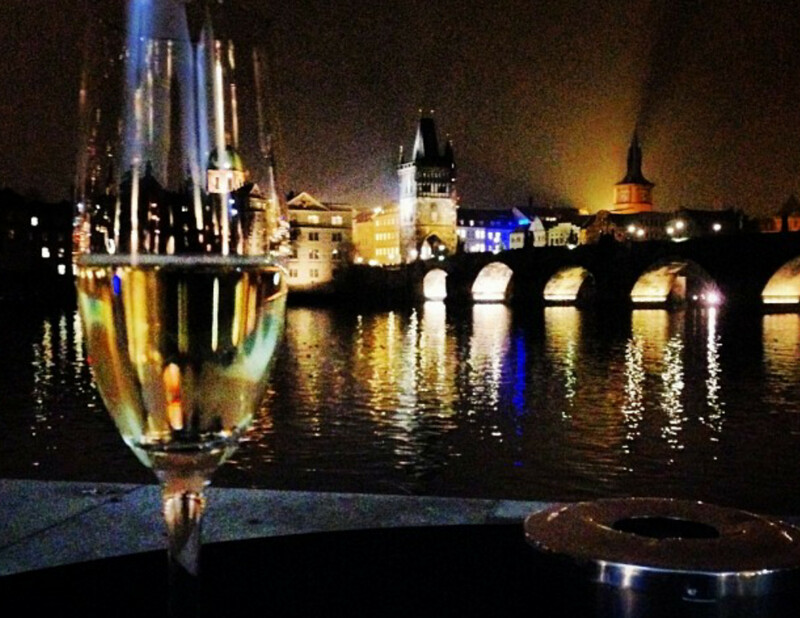 We drank champagne and drunkenly expressed our happiness to see Prague while we soaked in the views… More indoor to outdoor viewing. The window was my friend again. It was pretty darn nice though and I was in Prague. Well, not really, Kind of. Sort of. Well, I was practically there. That dude was so a spy. OBLIGATORY SHOUT OUT MOMENT: Photos taken by a colleague named Matt. He’s also a DJ “SLASH” Producer, the London based kind. He can be found on Instagram as MattRich91. Stalk him there. Yes, it’s that time of year again where the nights are getting darker, the bikini’s are firmly locked away in their summer drawer and we are all freezing are bottoms off when we open our front doors to head to work in the mornings. It’s stew time!!! And I have the perfect one for those that want warmed-up cold noses and one-pot-wonders. 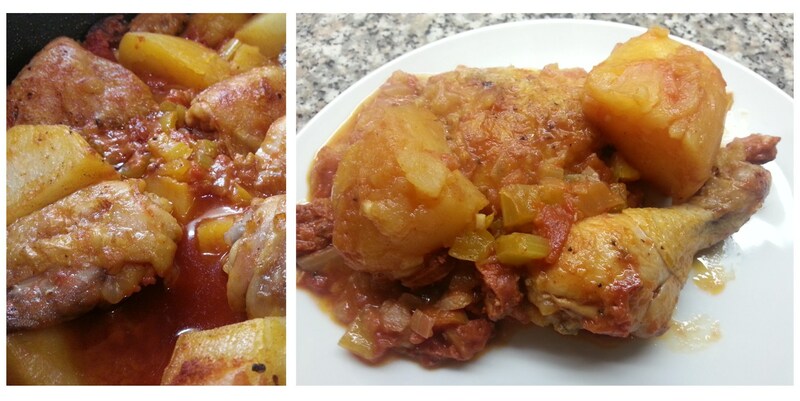 I present to you, Chicken & Chorizo Stew! This dish is good. And why wouldn’t it be? You’re pairing chicken with a fiery Spanish pig sausage for God’s sake! Definitely, a greater love story than Twilight… Match made. 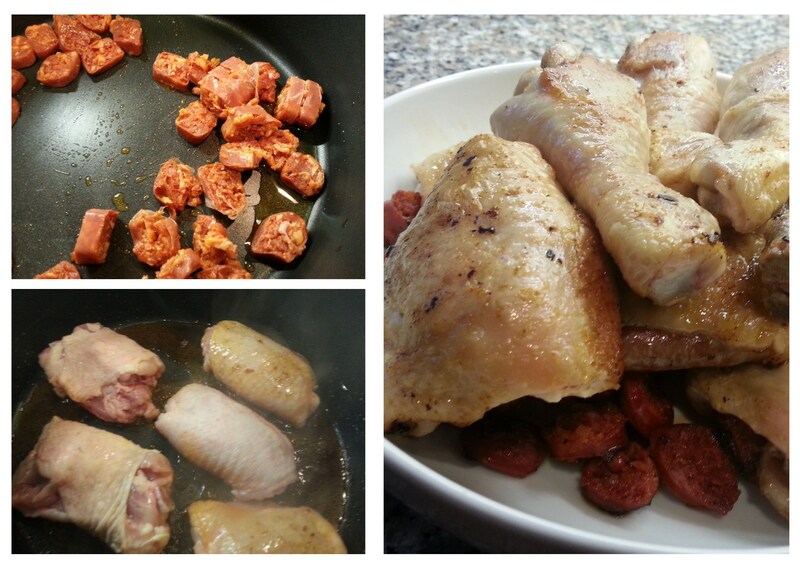 Chorizo packs a great deal of flavour and it works really well with the delicate chicken. 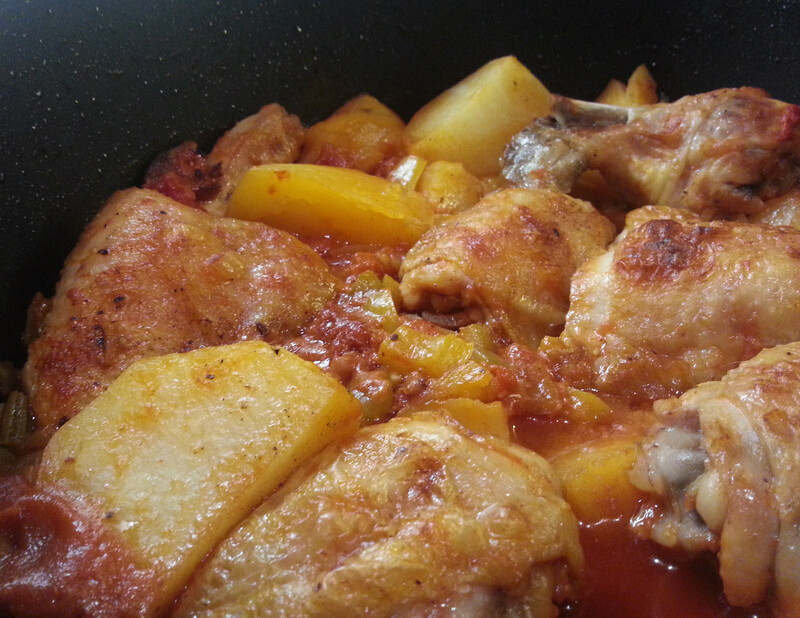 This stew has a slightly smoky, spicy flavour and the chicken ends up falling off the bone; moist and succulent! It’s also super for winter dinner parties. I made this last year (yes; last year. Worst. Blogger. EVER) and it was for a dinner party with some friends. The dish was delicious and convenient because once you have done the prep and done the simple steps outlined below, there really is little else for you to prepare but maybe a green salad and opening a few bottles of red wine. So warm up those noses, sit back and enjoy! Instead of listening to music, I watched a few episodes of “Friends”. Ah, it never gets old. Preheat the oven to 170˚C/330°F. Heat 1 tablespoon of the olive oil in a large ovenproof casserole dish over a medium heat. Gently fry the chorizo until it starts to brown and the oil has turned all lovely and red. Remove the chorizo from the casserole dish to a clean plate. Turn the heat up to medium-high and add half of the chicken pieces. 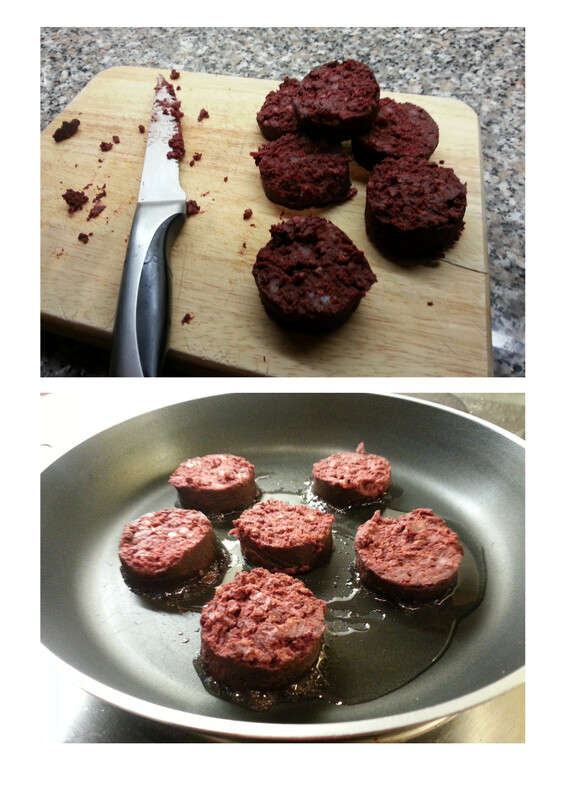 Brown them on all sides for about 3-4 minutes and then remove them to the plate with the chorizo. Brown the other half of the chicken in the same way and remove to the plate as well. Now add the tomatoes, chicken and chorizo. While the casserole is coming to the boil, add the pepper pieces, paprika and the potatoes to the casserole and cover with a lid. Let it simmer for 5 minutes and then transfer to the oven for an hour. Remove the lid for the last 15 minutes to let the top brown. Serve with a lovely green salad and a spicy Rioja Reserva to wet the pallet! 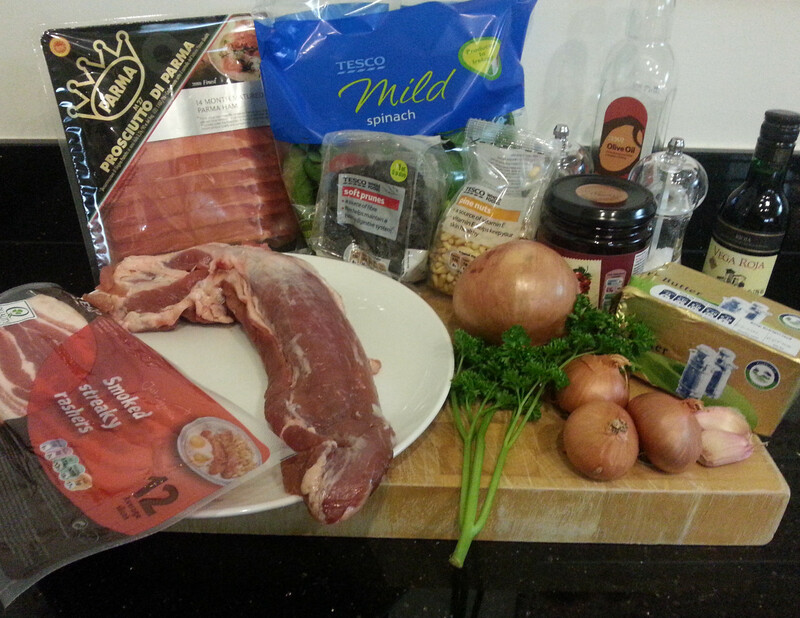 I present you with pork fillet. Ta-dah! So this recipe is not actually mine. The gravy I added to it is mine but not the stuffed pork recipe. My friend gave me this free supplement cookbook that came with The Irish Times one Sunday and it had this recipe in it. It’s by a lady called Domini Kemp and she created it specifically for dinner parties when the host desires as little leftovers as possible. 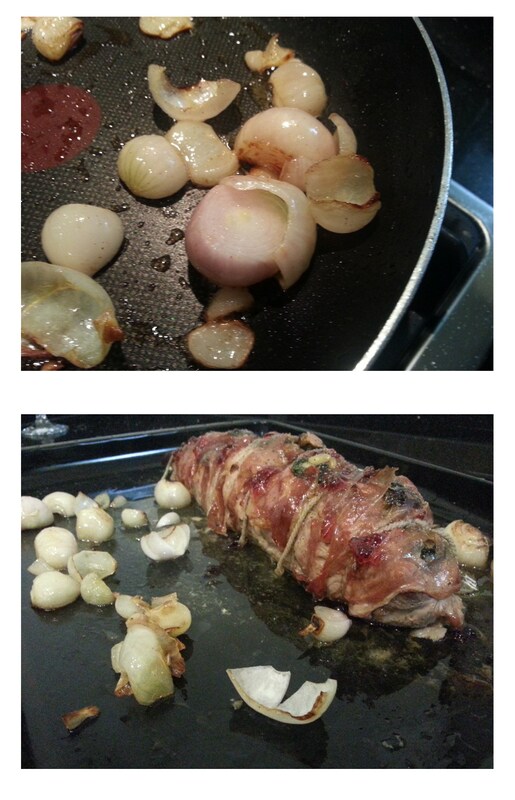 Now when I made this, it was just for me and my mother (who eats sparrow sized portions. No joke) so we of course had leftovers. However, I know how yummy this dish is and the plates would have been licked clean if we had more mouths to feed that night. If you are not completely sold on pork yet, give this a go. It’s good and tender and the stuffing is lovely as it has so much flavour with just the right amount of prunes to add a bit of sweetness. Prep and cooking time: 90 minutes if doing it all in one go and not prepping it the day before you want to serve it. I actually cooked this meal while watching re-runs of ‘The Fresh Prince of Bel-Air’… never gets old! Preheat the oven to 180˚C/360°F. Slice the pork in half, lengthways but not all the way through. Put it between two sheets of clingfilm and bash the life out if it with a rolling pin so you turn it into one large rectangle of flattened fillet. Now make the stuffing; gently sweat the onions in the olive oil until soft. Turn up the heat and add the rashers. Fry until brown and crispy. 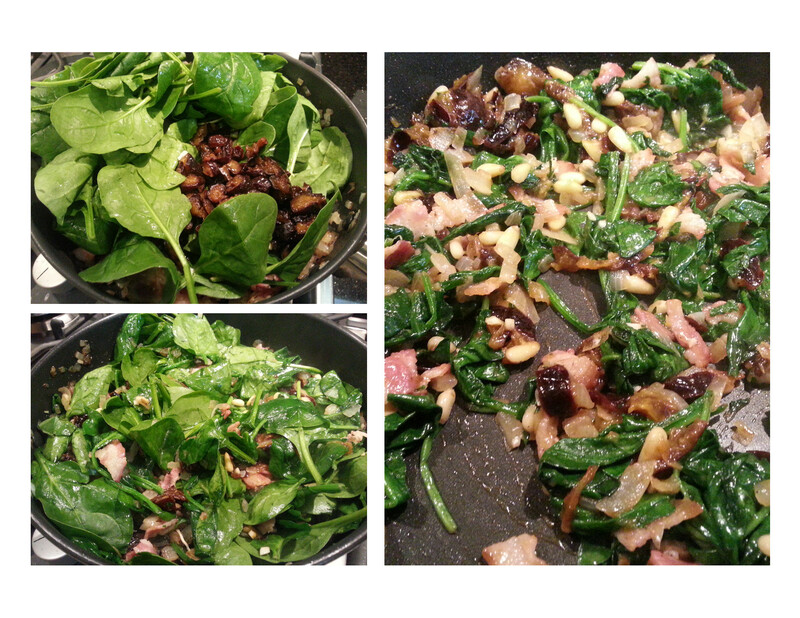 Add the garlic, spinach, chopped prunes and pine nuts and sauté until the spinach wilts. Keep the heat turned up so that any water from the spinach evaporates. See ya H2O… Season and set aside to cool. 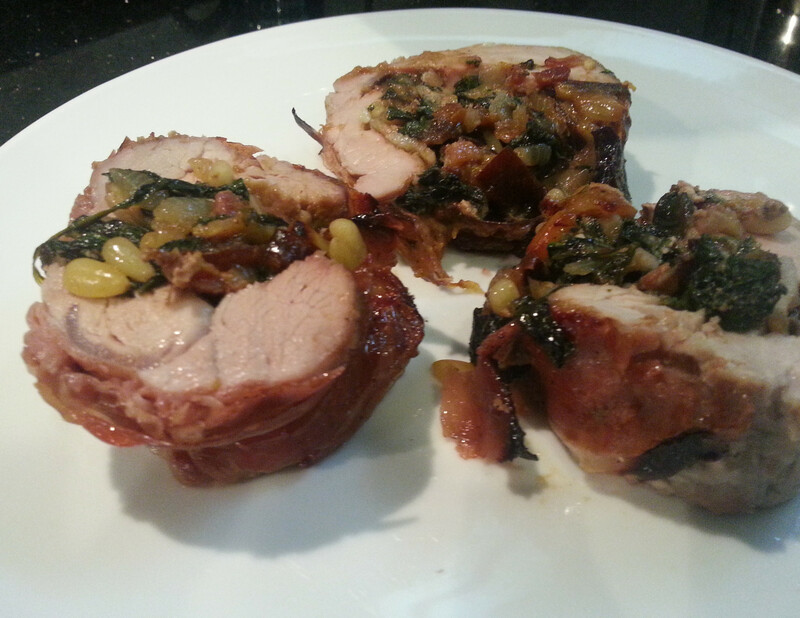 Once the stuffing is completely cold, you can stuff the pork and leave overnight, ready to cook. If you’re cooking it straightaway, then it’s ok to stuff the pork while the stuffing is still warm. It won’t poison you. Spoon the stuffing in a straight line down the middle of the pork, then roll the pork and wrap it up with the Parma ham, all nice and snuggy like. 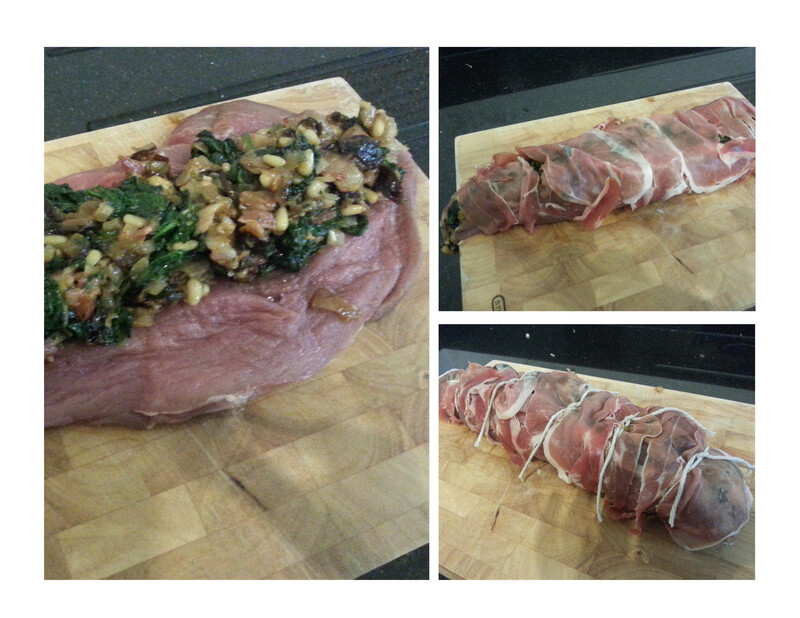 Tie at intervals with a string down the length of the pork fillet. If you want to make a gravy, put some water with pork stock and a little red wine into the roasting tin and place the pork fillet on top of it. It will make a yummy gravy. Meanwhile, heat up the butter in a saucepan and gently seat the shallots until golden brown. Take the pork out of the oven and add the buttery shallots to the roasting tray and some more stock and wine if necessary and smear the fillet with the redcurrant jelly. Baste with the juices, season with black pepper and roast for another 20 minutes. 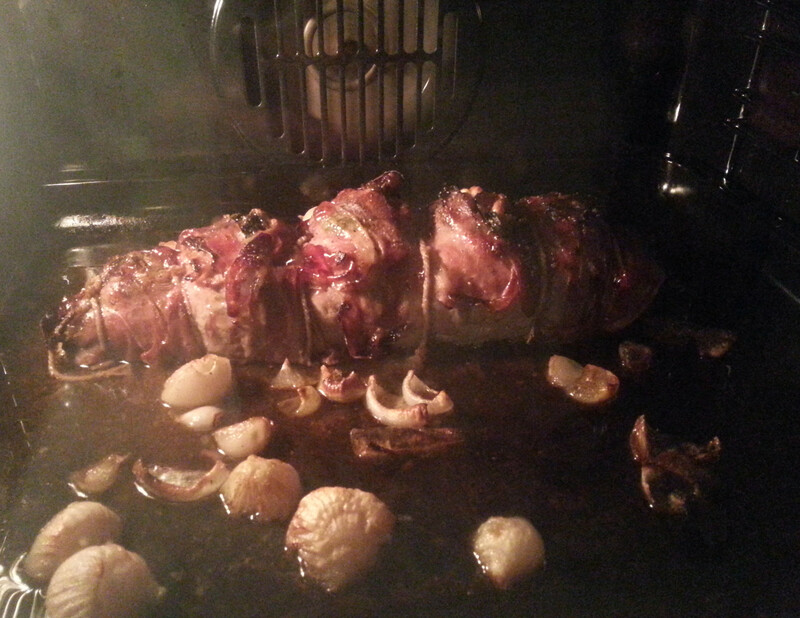 So basically, the pork is roasting for 40 minutes in total. Leave to rest for 10 minutes before carving. At this point, I thicken the gravy with a little cornflour in the roasting tin over the hob on a low heat. You just want it simmering. 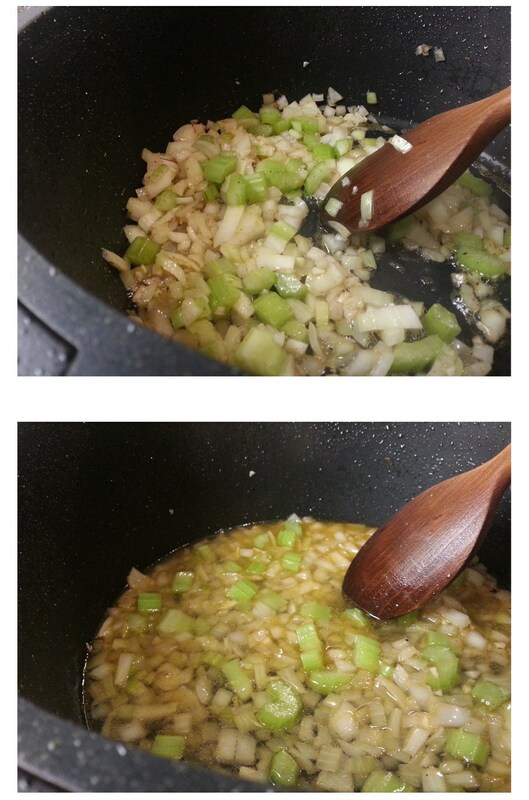 Stir gently and once thickened to your liking, take off the stove. Serve it with the delicious pan juices or gravy and whatever accompaniments you desire. My personal preference is roasted parsnips, carrots and potatoes. 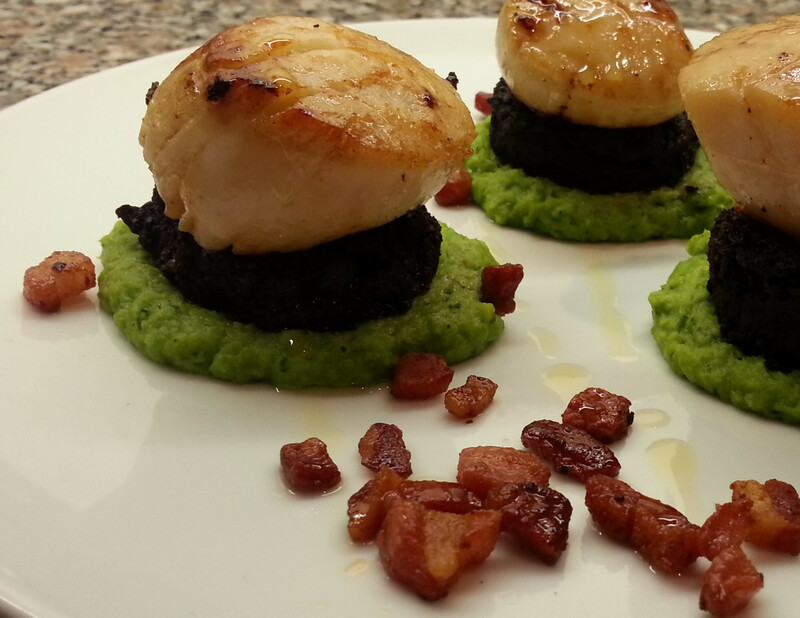 Some people are so afraid of cooking scallops and I just don’t understand why! They are not going to jump out of the pan and gnaw at your face; trust me, I know. They only take 2 minutes in a frying pan and really make a starter so full of class but simple at the same time. This dish is so colourful! 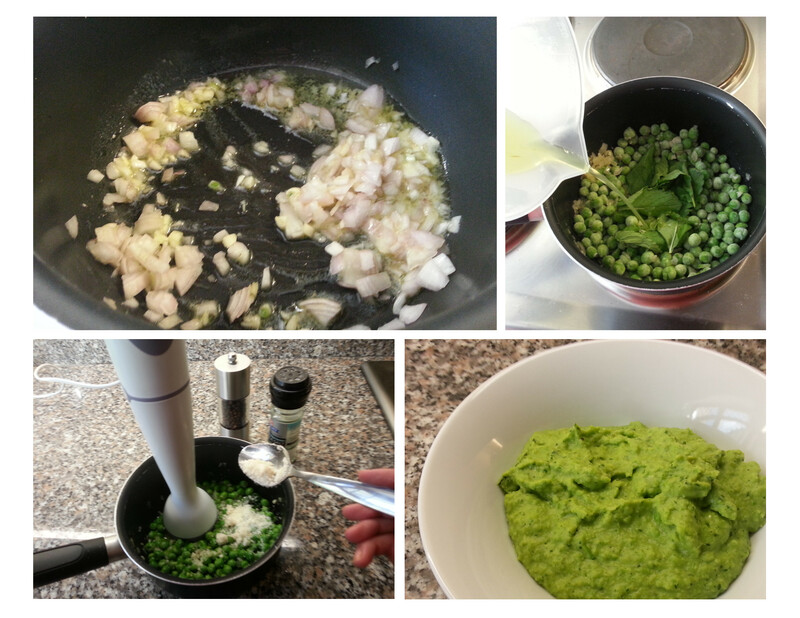 And I am now a huge pea purée devotee. I had never made it before and when I was whipping up my version I decided to throw in some parmesan cheese and wow… how awesome. I am so making this for my 5 month old Goddaughter when she is old enough to manage it. I literally could not stop eating it and it actually stood out more than the scallops on the dish. You go little peas! Take on those scallops. The black pudding also makes the dish a little more bulky so be prepared; if it’s a starter, be sure to have a break before you have your mains. It is very rich and filling, but so goddamn satisfying. Now grab your black pudding slices. Heat the pan to a low-medium heat and fry the pudding on both sides until cooked. Try not to burn it. You just want it slightly crispy on the outside. Should be about 5 minutes each side. Set aside and keep warm. 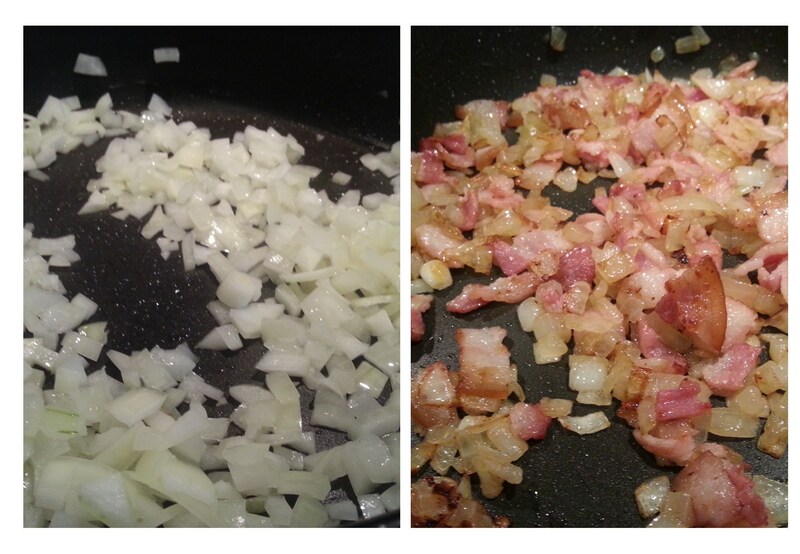 It’s now the pancetta’s turn to face the wrath of the frying pan. Wipe the pan clean and fry the pancetta over a medium heat until nice and crispy. Not burnt…Crispy! That’s it. 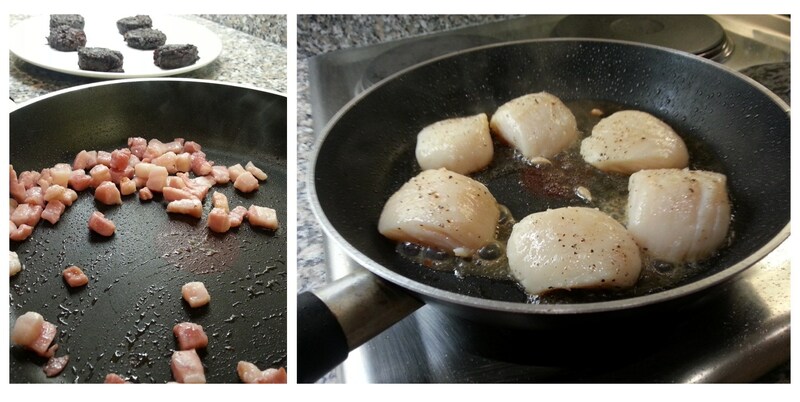 Don’t clean the pan as you’ll want to fry the scallops in the oil fat the pancetta omitted. Set aside. Now onto the big guns; grab your scallops. Season both sides with salt and pepper. Heat 1-2 tablespoons of olive in over a medium heat in your frying pan. The amount will depend on how much oil the fried pancetta let out on the pan. 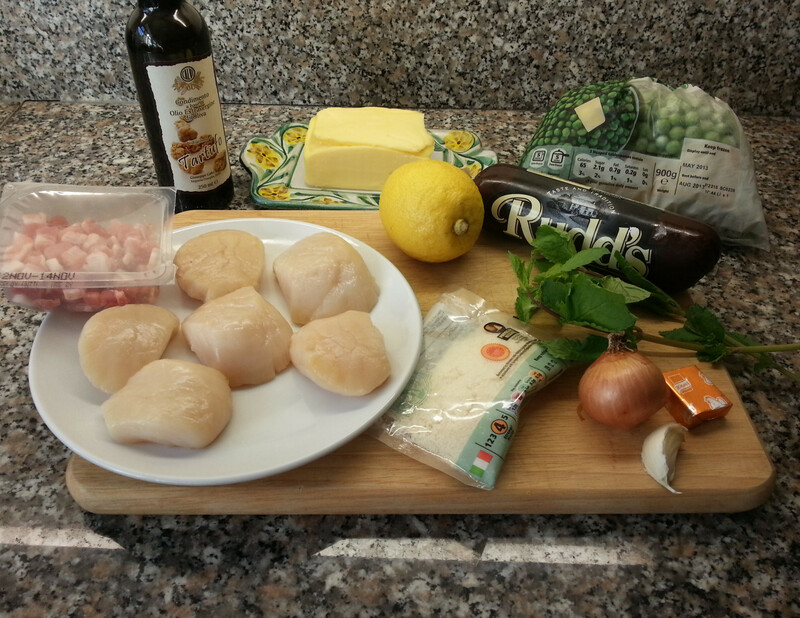 Once the pan is heated, place the scallops on it. After about 1 minute turn them over and cook for another minute. They should be golden in colour. As they are cooking, squeeze a bit of lemon juice over them. Now get your plates and spoon 3 little blobs of the pea purée on it. 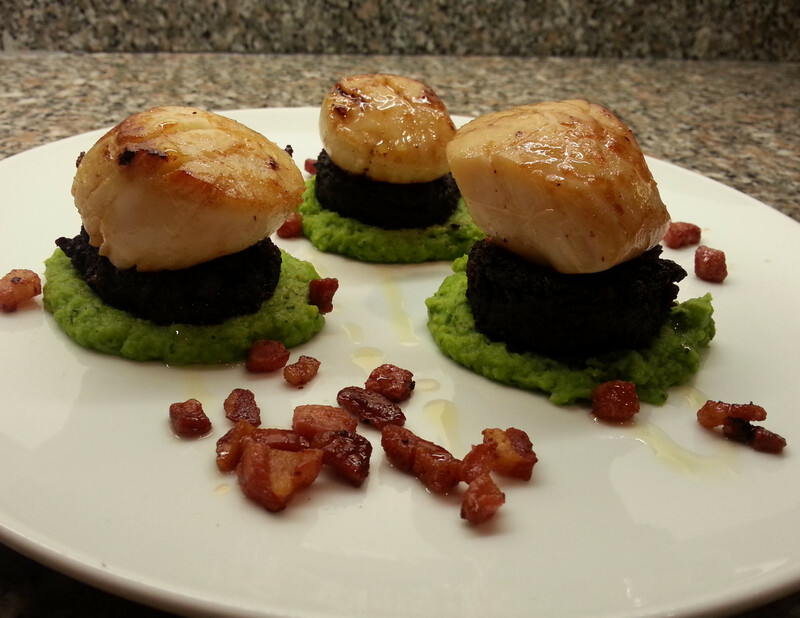 Add a slice of black pudding on each and then a scallop. Sprinkle the pancetta over the little rounds and dash a little white truffle oil over them. 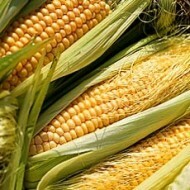 I love sweetcorn. It is so delicious, crisp and flavourful. When my boyfriend and I were on holiday in Madeira last year, everyday we ate fresh corn on the cob roasted on the barbie. We would strip the casing and silky threads off the cob, toss them in a little butter, season well with salt and black pepper, wrap in tinfoil and roast on the open barbecue. It is by far the best and most delicious way to cook and eat corn on the cob. And from my many travels around California, I learnt the whiter the raw corn kernels; the sweeter and more crisp the corn. This soup is a favourite of mine and whenever I am in a Chinese restaurant and watching my fat intake (if you can when in a Chinese restaurant! ), I always order this soup. It’s healthy, tasty and filling! The recipe is adapted from www.bbcgoodfood.com. I made the exact soup from the site before but I wasn’t too hot on the amount of lemon juice being added. For me, chicken and sweetcorn soup should not have a lemon flavour, but more an enhanced flavour of the components being brought out by the lemon juice. I doubled the recipe (because what’s the point of going to the effort of cooking when it only serves 2 portions??) and I kept the original amount of lemon juice. I used sesame oil instead of vegetable oil and I added more garlic and some mushrooms as I like my soup to be more of a meal then a watery starter. 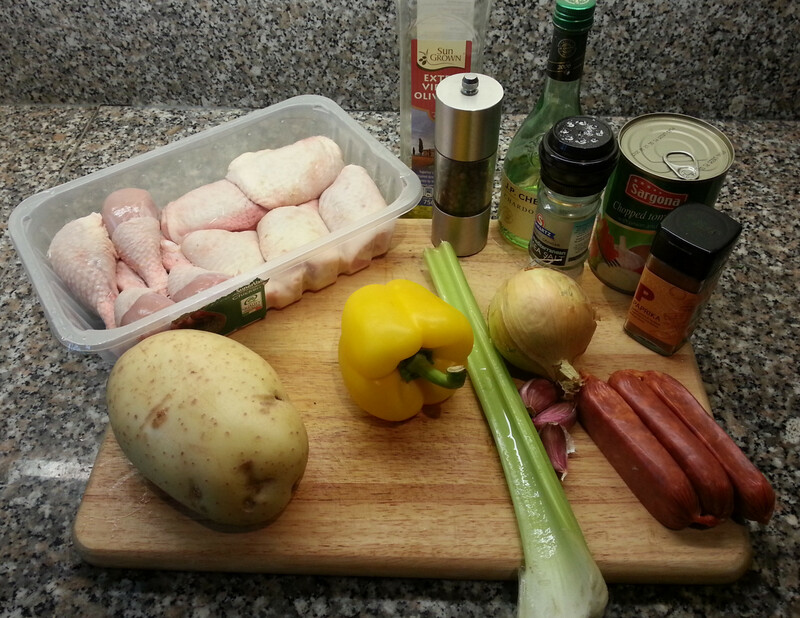 Prep and cooking time: 30 mins all in! Heat the oil in a deep saucepan over a low-medium heat and add the garlic, ginger, chicken and mushrooms. Cook for 4 mins without colouring. And the cornflour, a little stock and mix together. Then add the remaining stock and sweetcorn. Bring to the boil then simmer for 5-7 mins stirring occasionally. In a bowl, beat the egg and the lemon juice then slowly add it to the soup stirring with a chopstick or a fork to break it up and give an egg strand effect. Season to taste and add spring onions to garnish and soy sauce as desired.